Ultrathin metal-organic framework (MOF) nanosheets are attracting great interest in catalysis due to their unique and intriguing two-dimensional (2D) features. 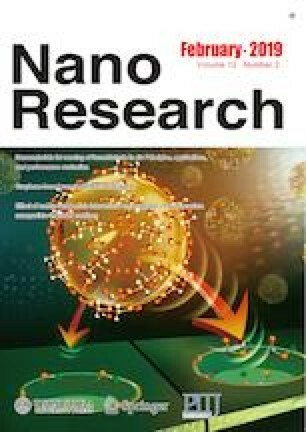 Although many progresses have been achieved, it is still highly desirable to develop novel strategies for controllable synthesis of the well-defined ultrathin MOF nanosheets. Herein we report a polyvinylpyrrolidone (PVP)-assisted route to synthesize the ultrathin Ni-MOF nanosheets characteristic of 1.5 nm in thickness, in which PVP is reacted with 2-aminoterephthalic acid (H2BDC-NH2) via formation of C=N bond, followed by coordination with Ni2+ ions to form the ultrathin MOF nanosheets. Impressively, when used in the Knoevenagel condensation reactions of propane dinitrile with different aldehydes, ultrathin Ni-MOF nanosheets display the significantly enhanced catalytic activity and good stability in respect with the bulk Ni-MOF, mainly owing to the exposed active sites as well as facile mass transfer and diffusion of substrates and products. Xiaofei Zhang and Lin Chang contributed equally to this work. Supplementary material is available for this article at https://doi.org/10.1007/s12274-018-2235-1 and is accessible for authorized users. This work was supported financially by the National Key Basic Research Program of China (Nos. 2014CB931801 and 2016YFA0200700, Z. Y. T.), National Natural Science Foundation of China (Nos. 21890381, 21721002 and 21475029, Z. Y. T.; 21722102, 51672053 and 21303029, G. D. L.), Beijing Natural Science Foundation (No. 2182087, G. D. L.), Frontier Science Key Project of Chinese Academy of Sciences (No. QYZDJ-SSW-SLH038, Z. Y. T.), K. C. Wong Education Foundation (Z. Y. T.), and Youth Innovation Promotion Association CAS (No. 2016036, G. D. L.).